13. M. Fares and X. Zhang* “Quantification of cellular proteostasis in live cells using the AgHalo sensors“, Curr. Protoc. Chem. Biol., 2018:e58. 12. K.H. Jung, M. Fares, L.S. Grainger, C.H. Wolstenholme, A. Hou‡, Y. Liu, X. Zhang*, “A SNAP-tag fluorogenic probe mimicking the chromophore of the red fluorescent protein Kaede“, Org. Biomol. Chem., accepted. Part of New Talent Special Issue. 11. H. Hu, C.H. Wolstenholme, X. Zhang*, X.S. Li*, “Inverted solvatochromic stokes shift in GFP-like chromophores with extended conjugation“, Chin. J. Chem. Phys., 31 (2018), 599-607. 10. 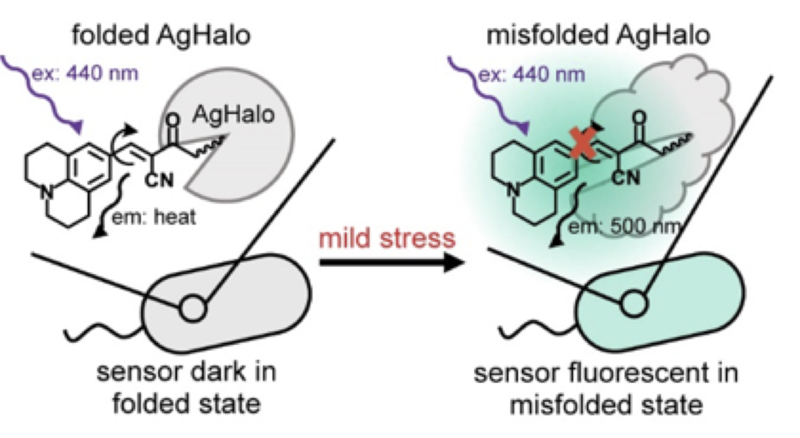 Y. Liu, K. Miao‡, Y. Li, M. Fares, S. Chen‡, X. Zhang* “A HaloTag-based multi-color fluorogenic sensor visualizes and quantifies proteome stress in live cells using solvatochromic and molecular rotor-based fluorophores“, Biochemistry, 57 (2018), 4663-4674. 9. B.I. Leach, X. Zhang, J.W. Kelly, H.J. Dyson, P.E. Wright*, “NMR measurements reveal the structural basis of transthyretin destabilization by pathogenic mutations“, Biochemistry, 57 (2018), 4421-4430. 8. Y. Liu, C.H. Wolstenholme, G. Carter, H. Liu, H. Hu, L.S. Grainger, K. Miao‡, M. Fares, C.A. Hoelzel, H. Yennawar, G. Ning, M. Du, L. Bai, X. Li, X. Zhang*, “Modulation of fluorescent protein chromophores to detect protein aggregation with turn-on fluorescence“, J. Am. Chem. Soc., 140 (2018), 7381-7384. 7. A. Pedley, G. Karras, X. Zhang, S. Lindquist, S. Benkovic*, “The role of HSP90 in the regulation of de novo purine biosynthesis“, Biochemistry, 57 (2018), 3217-3221. 6. Y. Liu, M. Fares, X. Zhang*, “Monitoring proteome stress in live cells using HaloTag-based fluorogenic sensor”, Methods in Molecular Biology: Protein Misfolding Diseases, 2018, invited book chapter. 5. X. Li, T. Wang, P. Duan, M. Baldini, H. Huang, B. Chen, S. Juhl, D. Koeplinger, V. Crespi, K. Schmidt-Rohr, R. Hoffmann, N. Alem, M. Guthrie, X. Zhang, J. Badding*, “Carbon nitride nanothread crystals derived from pyridine”, J. Am. Chem. Soc., 140 (2018), 4969-4972. 4. Y. Liu and X. Zhang*, “Heat shock protein reports on proteome stress”, Biotechnology J, 13 (2018), 1800039. 3. M. Fares, Y. Li, Y. Liu, K. Miao‡, Z. Gao‡, Y. Zhai‡, X. Zhang*, “A molecular rotor-based Halo-tag ligand enables a fluorogenic proteome stress sensor to detect protein misfolding in mildly stressed proteome“, Bioconjutate Chem, 29 (2018), 215-224. 2. Y. Liu, M. Fares, N. P. Dunham, Z. Gao‡, K. Miao‡, X. Jiang, S. S. Bollinger‡, A. K. Boal, X. Zhang*, “AgHalo: A facile fluorogenic sensor to detect drug induced proteome stress“, Angew. Chem. Int. Ed., 56 (2017), 8672-8676. 1. Y. Liu, K. Miao‡, N.P. Dunham, H. Liu, M. Fares, X. Li, A.B. Boal, X. Zhang*, “The cation-π interaction enables a Halo-Tag fluorogenic probe for fast no-wash live cell imaging and gel-free protein quantification“, Biochemistry, 56 (2017), 1585-1595, (ACS Editor’s Choice). Featured by Viewpoint in Biochemistry.